All I can say is WOW, what a privilege to be able to feature such an amazing model on this Showcase blog. The colour tones are absolutely stunning, the detail is superb. Today I got to chat with Mitzy about the recent Maw-Krusha he painted as part of his Ironjawz collection. 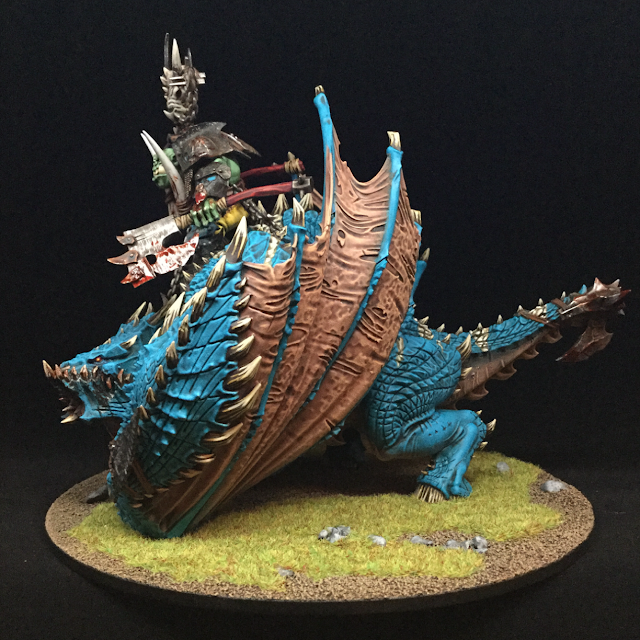 We talk painting, hobbying, gaming etc. Hope you like. Sean: Hi Mitzy (Or shall I call you something else? ), How are you? Sean: Ok, Mitzy it is then. 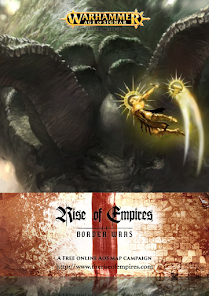 Where about are you from, what is Age of Sigmar like in your area? Mark: I live in Ely which is just outside Cambridge UK, I've been here for the past 18 years. What is AOS in the area like is a tricky question to answer from my perspective. I try to game once per week (real life permitting). Gaming in Cambridge is really good, there are two clubs who meet every week Sons of War on a Wednesday and 2D6 Dice Lodge who meet on a Friday night. Unfortunately I don't find myself able to get to these two clubs although I know that they both very well attended. The gaming that I do is with my group of mates who are collectively know as EATBATS (East Anglian Tabletop Battle And Tournament Squad). We are a group of 10 guys who all live in or around Cambridge. 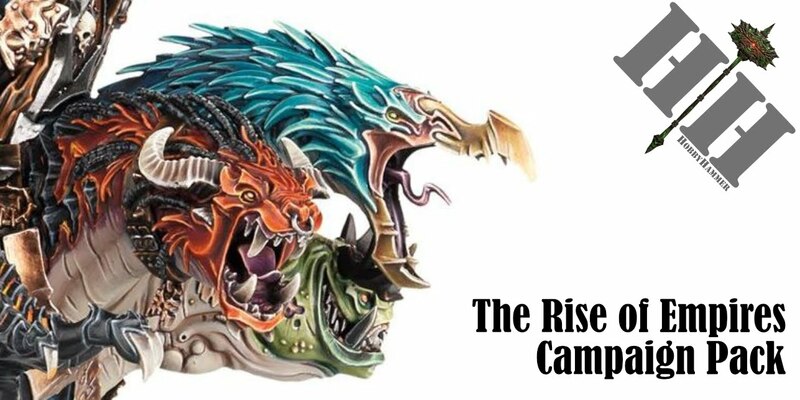 We began meeting up and gaming when myself, Roger Barnett, Dan Seymour and Andy Cherry decided to attend Throne of Skulls for an 8th Edition tournament. We decided we needed a team T-Shirt and EATBATS was born. Since then we met a few more like minded guys and as a group of 10 try to attend events as regularly as possible. We are all huge hobby enthusiasts and all paint to a high standard, collectively we have all won trophies at one event or another. We communicate constantly throughout the day using Facebook Messenger, it is routine for my phone to slowly buzz its way accross the desk during meetings as the lads all chat about the game and any latest project. 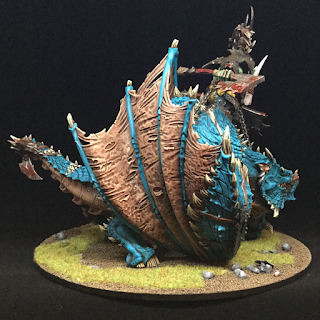 Sean: Awesome, The miniature in question, the Maw-Krusha with Megaboss is stunning, the turquoise and brown really compliment each other, what gave you the idea for the colour scheme? Mark: Thank you so much, I really appreciate the compliment! 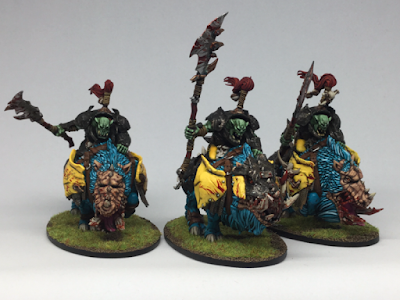 The colour scheme was chosen to compliment my Ogre Kingdoms army. My ogres were actually commission painted by one of my fellow EATBATS team mates Roger Barnett as I had owned them for a couple of years and never got round to doing anything with them. I took delivery of the Ogres as the End Times occurred and killed off 8th edition (timing to perfection!). The yellow and Turquoise feature heavily across the army and so it was a natural selection for me to use those colours on my Orruks. All three sub sections were sprayed using GW Corax White as an undercoat. The next job was to base coat the beast. At this point and because of the size of the MawKrusha I plumbed straight for my Air Brush. I loaded up with GW's Bugman's Glow and gave the underside of the model a thorough coat. Once this was dry I blasted Game Colour Turquoise (72.024) over the top half, this allowed me to give the two colours a more natural blend where they meet. I treated the two wings to the same treatment airbrushing the Bugman's Glow over the whole wing, I then hand painted the Game Colour Turquoise along the wing fingers. 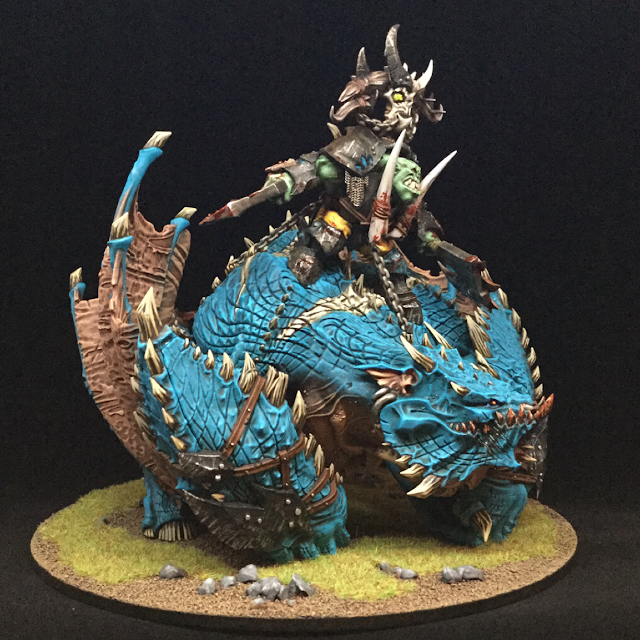 Once this was done I then hand painted each and every Horn and Spine on the MawKrusha in a base coat of Rinox Hide. Approximately 2 years later...... (There are a LOT of spines/horns) I was ready to shade the beast. I applied (VERY Liberally) Agrax Earthshade to the whole model including the wings. I really do go overboard with my washes and I'm not worried about pooling as I rectify this in the next stages. I left the model overnight to dry, the next evening it was time to begin highlighting up the flesh of the MawKrusha. I started with the underbelly. This was an easy process and I followed the GW paint chart to highlight his soft fleshy underbelly. First up was a thorough drybrush of Bugman's Glow, once complete I then applied a second drybrush of Cadian Fleshtone concentrating on the more obviously raised areas such as the ribcage etc. Finally I drybrushed with a final highlight of Kislev Flesh. This three stage process really gives a natural flesh finish to his soft underside (you might describe it as looking "as soft as a puppies tummy" but you'd be crazy to stroke it!!!). Now it was time to divulge the same care and attention to the blue/green hide. I was clear that I wanted the MawKrusha to be as close to Turquoise as possible so I began to add white to the Turquoise and drybrush up in steady layers until I was satisfied. I first drybrushed the whole area again with Game Colour Turquoise, and then began to measure out exact quantities of Turquoise and White allowing me to replicate the colour if I ran out on each pass. Eventually I finished up with the final skin tone which I think works really well. It was then that I felt the need to break up the Turquoise with some stripes of a contrasting colour. So I replicated the stripes on my Orruk Boar Boys (see pic at the start of my thread on TGA.community for reference) down the length of the back. I started with a Base Coat of Zandri Dust to form the stripes, then I washed them with Agrax Earthshade, once this was dry I applied a layer of Zandri Dust on the raised areas leaving the Agrax in the recesses, then I highlighted up the stripes with a layer of Ushabti Bone, then a layer of Screaming Skull and finally a layer of Palid Wych Flesh. This process didn't take long and really does give the MawKrusha a distinctive look. Next up were the spines and horns... This bit took AGES... I followed Emma's advice again from the Warhammer TV painting tutorial and applied vertical stripes of Balor Brown from the tip downwards for three quarters of the length of each spine. Then I did the same with Screaming Skull but stopped a little short of the Balor Brown to give a really great horn effect. It was totally worth it and I think the detail in the spines/horns/hooves/teeth really frame the model. Finally it was time to paint eh leather and armour plates, the leather was base coated in Mournfang Brown and the Armour in Abaddon Black. Both were again heavily washed in Agrax Earthshade (spotted the theme yet?) and left to dry. The leather was highlighted with Mournfang Brown and then again with some Kislev Flesh added to lighten the tone. The black was stippled with Leadbelcher to appear scratched and chipped. Sean: Now thats a tutorial, I also love the pale orc colour, whats your recipe for Orc skin? 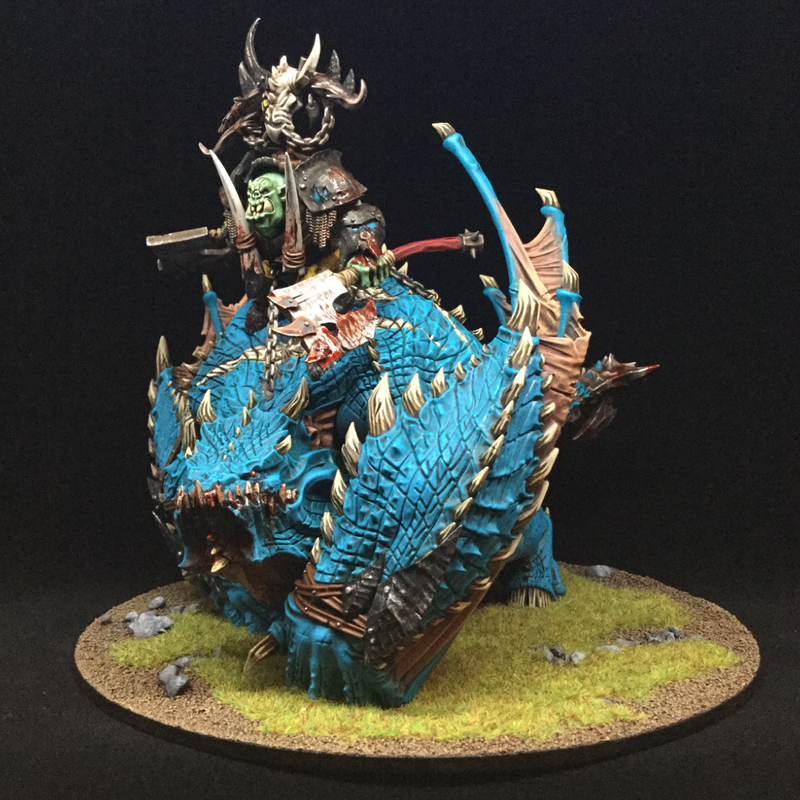 Mark: With the MawKrusha finished I set about painting the Megaboss. As with all of my miniatures I painted in all of the base colours, Warboss Green for the Orruk flesh, Abaddon Black for the Armour, Leadbelcher for the weapons and chain mail, Yriel Yellow for the Boss's trousers, Mournfang Brown for all the leather and Mephiston Red for the weapon handles. He was then given a bath in Agrax Earthshade. 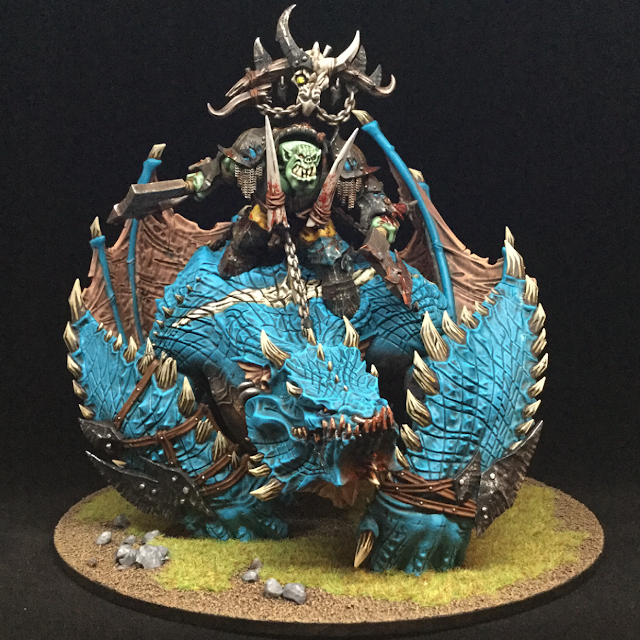 When he had dripped dry, I set about highlighting up the Orruk flesh by adding skull white to Warboss Green over several layers until I was satisfied with the effect. The same method was applied to his trousers with White being added to the Yriel Yellow to highlight up his pants. A heavy stippling of Leadbelcher was applied to the Black armour and he was ready to be glued on to his mount. Once glued in place, I highlighted up the axe heads with Runefang Steel, and the model was ready for weathering. For this I applied a tiny drop of Trollslayer Orange to a big puddle of water to give me a very watery orange, this was dabbed on to all areas of the black armour and the chainmail to give a slightly rusted appearance. I then used Nihilakh Oxide to oxidise the rivets accross the whole model. Sean: Are you guys going to be playing in the summer campaign from GW? Mark: Sadly, whilst I would love to get involved, my work and young family will probably prevent me from doing so, I will pop in to the Cambridge GW and see what is going on when it all kicks off and If I can do so I'll get some games in, after all what's the point of having a destruction army and not getting involved in some WAR!!!! Mark: I'll be honest I am really excited too... We are @Jimbo @Thornshield @Devilreefman all putting in a lot of effort to make this event really unique on the scene. This weekend Jimbo and I are starting to manufacture some of the bespoke scenery for the event. With 40 players and therefore 20 tables we have our work cut out to ensure that there is enough scenery for all of the tables. 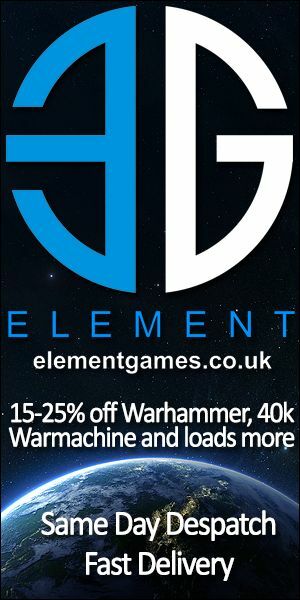 Following SCGT we all agreed that we did not want our visiting players to have to lug scenery to the event other than their realmgates so we are going for broke and plan to ensure that there is enough scenery for the event. As you know this is no mean feat given that AOS works best with LOTS of scenery... But we will rise to the occasion and you will be gaming on some really great tables. The bespoke nature of the scenery will mean that we can tailor the narrative of the event to reflect the terrain on the tables which I hope will really add to the weekend! We are rally looking forward to seeing what you guys (the players) all do in terms of army themes and can't wait to see such a high calibre of hobby on the tables! Sean: Looking forward to that one! So what is on your painting table right now? Mark: At the moment I'm getting ready for Alliance on the 7th August, for that event I want to go all out IronJaws. So I have 6 Gore Gruntas built, primed and the Turquoise laid down, last night I got the base coat of Warboss Green and Black down too so they are underway. I expect them to take a while as the first three took an age to get the fur on the Pigs right. Still I have a week off at the end of next week so should blast through them fairly quickly. Sean: What got you into this Hobby and how long you been Hobbying? My first ever box set of miniatures was given to me at Christmas by my parents, I got a box set of Adventurers and a box of Monsters, at the same time I like so many others got a box of humbrol paints and promptly ruined them, but I guess they looked so cool way back then! How times have changed huh! I have always loved the hobby scene and I truly escape when I get even 30 minutes in my hobby room to paint. I find it 100% relaxing and it is probably the only time when I literally switch off. Sean: Finally! Anything else you wanna add, promote, pimp out etc. twitter, websites? Sean: Thank you so much dude! Pleasure talking to you and looking forward to meeting you, and your Maw-Krusha in person at RAW16!